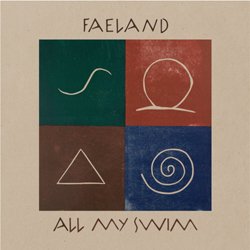 ‘All My Swim’ is the debut album from Bristol based folk duo Faeland – Rebecca Nelson (lead vocals, guitar) and Jacob Morrison (guitar, ukulele, banjo, backing vocals), the pair assisted on several songs by some very able musicians delivering a sometimes dreamlike pastoral sound. They seem to be delving into that hinterland of faerie music and bucolic wonder which characterised several bands in the early seventies. For a debut album it’s very assured, the woody timbre of the opening song, ‘Too Much’, with its supple bass, hushed percussion and plangent guitar lines bodes well, the song reminiscent of Scotland’s Doghouse Roses, another duo who mine a similar vein. Much of the album benefits from strong arrangements, the Eastern influenced ‘Prayer Song’ is somewhat intoxicating with Nelson’s voice floating above the instruments while the title song features a harp tinkling like raindrops while a clarinet adds some colour. Such embroidery does give the album a fine finish, the songs all perfectly acceptable to the ears but overall there’s a lack of depth and in particular, any sense of darkness or melancholia which to this reviewer’s mind would give the album some heft. Ms. Nelson sings well for the most part but at times her voice is just too lightweight. Meanwhile the songs themselves lack a distinct personality. ‘Chantress’, the most traditional sounding song here, skips along in a fine manner but one really wants it to swing with a lusty vigour. Likewise with the closing song, ‘Find Me‘, a song which opens like a little cousin to Fairport’s ‘A Sailor’s Life‘; rambling guitar, lashings of cymbal and stratified fiddle promising a turbulent voyage but ultimately not stormy enough. It’s early days for Faeland and there are many promising moments to be heard on the album. Hopefully, like a good whisky, they will mature with age.